Facebook’s new Timeline for business pages has brought many opportunities to many page administrators. From cover images to profiles images to milestone images, but all have unique sizes that are not standard. 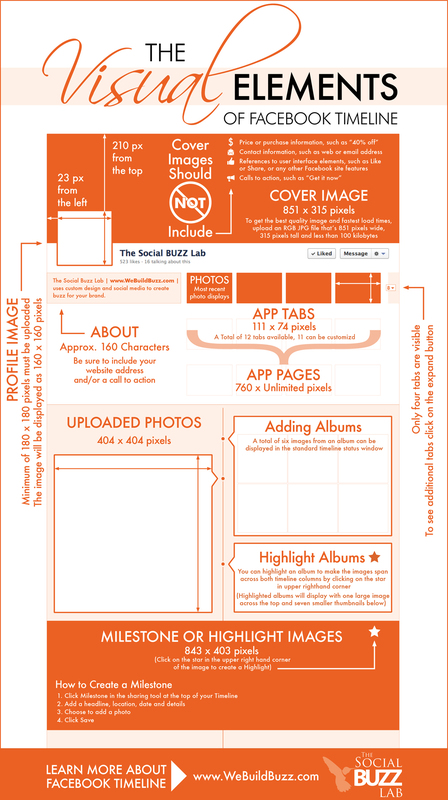 Erika Bentley, Graphic Designer for The Social Buzz Lab, created this infographic to help you understand image sizes and terminology used for an attractive and engaging Facebook Page using the timeline features for business pages. If you’re still confused about how to use graphics in Facebook Timeline and if you want to learn more about Facebook Timeline attend the Social Buzz Lab June 7 Handzon workshop in Roanoke, Virginia. Learn how to get the most out of your Facebook Page with Facebook’s new Timeline during this training. Click here to register now!! Save $30 if you register by May 31. For more details click here. i love info-graphics. I’ll be teaching a class with high school students this summer and I’ll be sure to pull up this info-graphic for them to make all the rules and regulations as easy to understand and as hands-on as possible. Dorien, I love infographics also! I have an infographic board on Pinterest and it has the most pins! I hope your high school students find it useful. I find myself looking for the image sizes all the time so I think this will be one that I keep by my computer. Thanks so much, Dorien! I’m glad you found this infographic to be valuable for both yourself and your students. So many people are visual learners. I know I am! This was such an informative inforgraphic. I just love these. I”m a visual person so it really clicks with me. Great information and thanks for the quick reference! Thank you Lisa! I am a visual person also!! I’m glad you found the infographic helpful! I love these types of visuals, I will be passing this one on. Thanks so much Elaine!! I appreciate you passing it on!! Added this infographic to my social media list on Pinterest. I collect them! Woohoo! You have been pinned and are now in my archives…. 🙂 Thanks for sharing! Thanks Norma! I will follow your boards on Pinterest too! Thanks so much for pinning this infographic, Norma! I’ll be sure to follow your boards on Pinterest as well!! Great infographic! I will definitely be sharing and adding to my pinterest board. Thanks! Thanks Helena!! I appreciate your sharing and pinning!! This is a great infographic. I’m a sucker for infographics and this one is actually REALLY useful. Shared it with my followers and readers. Thanks Marie! I am an infographic lover also!! We appreciate you sharing it! !